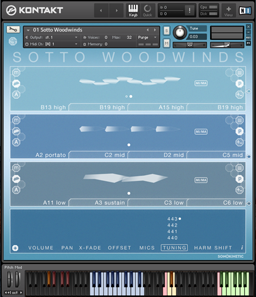 Many of our phrase-based libraries are conceived with a specific usage in mind... Maximo for intense action, Sotto for subtle scoring and Grosso for dramatic chases. The performances captured in these libraries have been put to use by our composer base in varied and surprising ways. 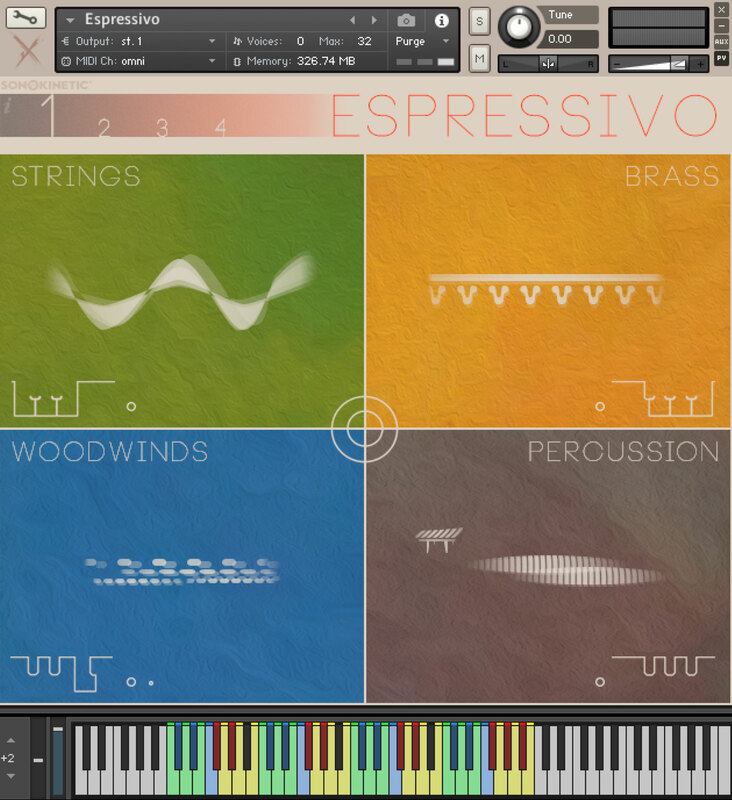 For this reason we can't wait to hear what you create using our most intense library yet... "Espressivo". The sounds of horror, terror and suspense are as old as cinema itself, from Herrmann's "Psycho" & "Vertigo" to Goldsmith's "Alien" & "The Omen". These dissonant strings, stabbing brass sections, skittering percussion and aleatoric woodwinds are as synonymous to the genres, making our hair stand on end and forcing us to avert our eyes from the screen. Many other composers such as Karlheinz Stockhausen and Charles Ives have been our inspiration too, creating a palette of sounds which provide both inspiration and intimidation. In the recording sessions we pushed our orchestra to their physical and mental limit and they rewarded us with some extraordinary playing techniques that would be just impossible for a composer to pull off using multi-sampled libraries. Our strings, brass, woodwind and percussion players wrung everything out of their instruments. 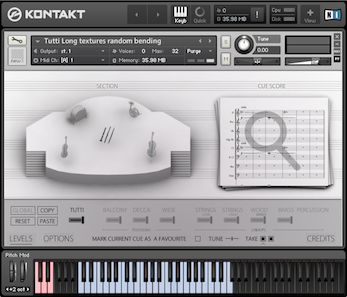 After they were done we wrapped the performances in a brand new Kontakt engine to ensure maximum flexibility and playability from the hundreds of phrases on offer. For the first time ever with a Sonokinetic library you can trigger up to 48 phrases simultaneously (from the hundreds available), all tempo synced and with multiple microphone options. Pads, rhythmic loops, crescendi, melodies and stabs all meld together in one gloriously terrifying instrument sure to add realism, authenticity and a dose of drama to your cues. 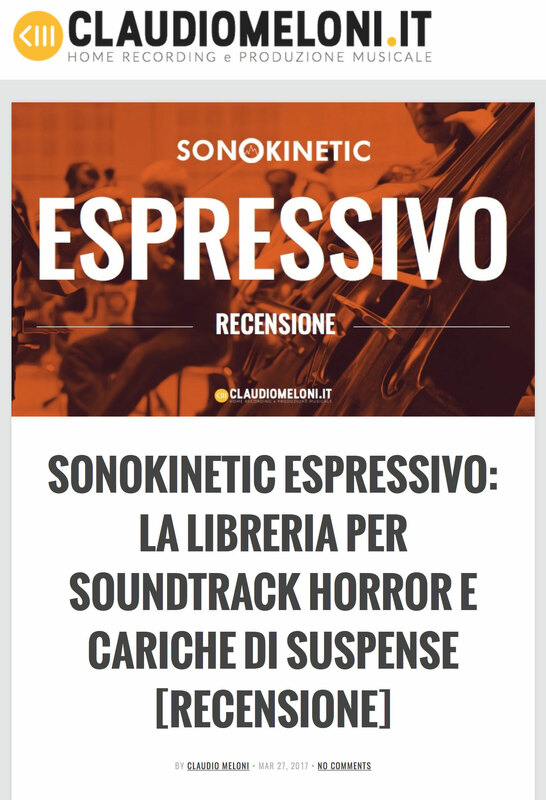 We, at Sonokinetic BV, are very proud to introduce Espressivo and can’t wait to hear how you put it to use in your own compositions. We love to hear what our valued customer base can do with our products, so let's work together to create something special. 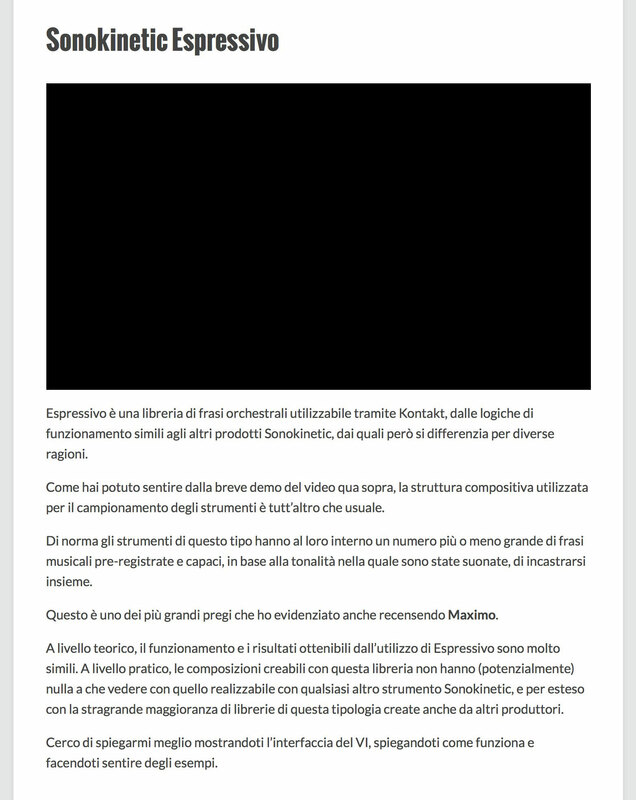 On the left is the main interface for Espressivo. 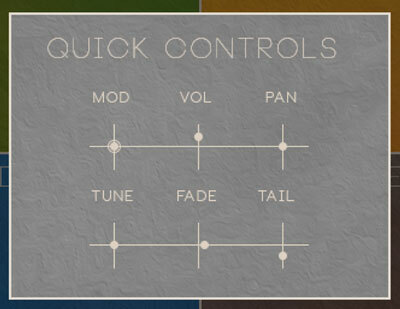 This particular screenshot is showing number 1 of the 4 available presets. Each of them operates in the same way. 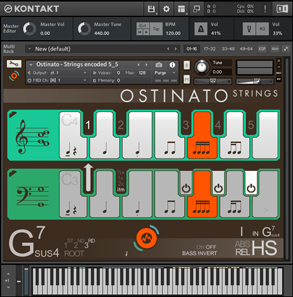 The orchestral sections are color coded consistently both within the interface and on the virtual Kontakt keyboard: Strings, Woodwinds, Brass and Percussion. 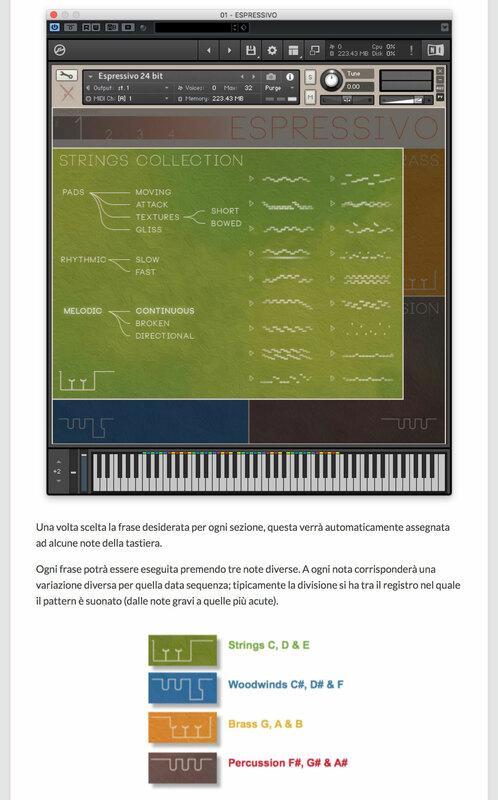 Espressivo has 4 user presets and these relate to 4 different octaves of the keyboard. Each octave has 12 keys which relate to 12 different phrases: 3 string, 3 woods, 3 brass and 3 percussion. The mapping of these 12 phrases is the same for every octave and color coded for easy recognition. 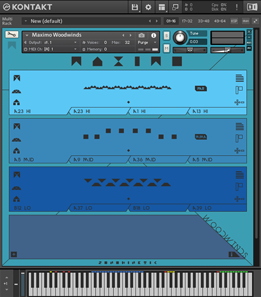 The presets can be selected by simply playing within that preset’s octave on the keyboard, or by clicking the preset number in the interface. You can purge the samples from an individual preset field with Cmd / Ctrl left-click on a preset number. You cannot purge the currently selected preset. Use this function to free up system RAM. 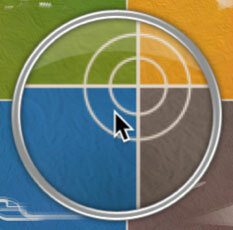 Click the inner ring in the centre of the interface to display the quick control menu window. This window shows the most common options for adjusting the playback and functionality of the currently playing, or last played phrase. 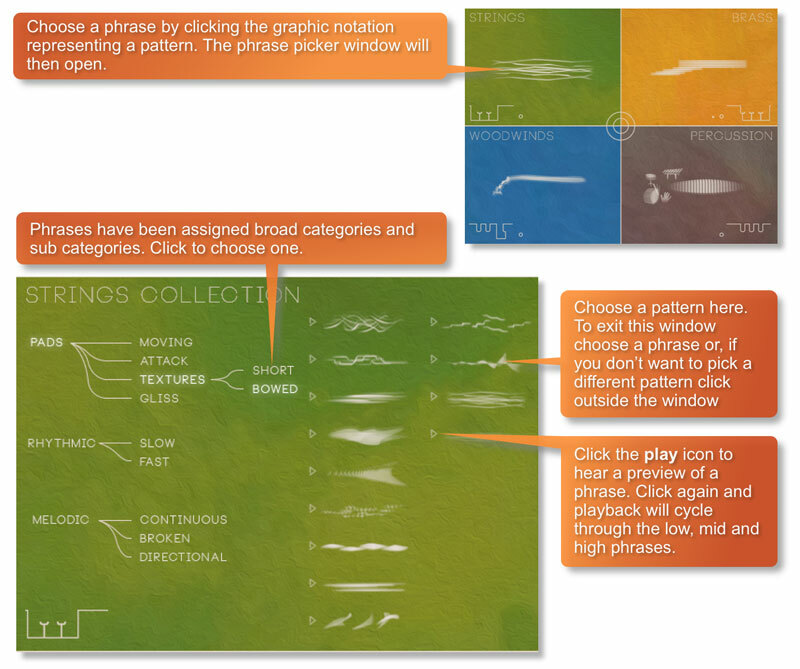 This makes it easy to audition phrases and then tweak them quickly using simple controls. 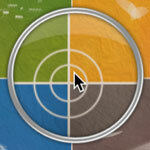 Click the outer ring in the centre of the interface to display the microphone mixing controls. 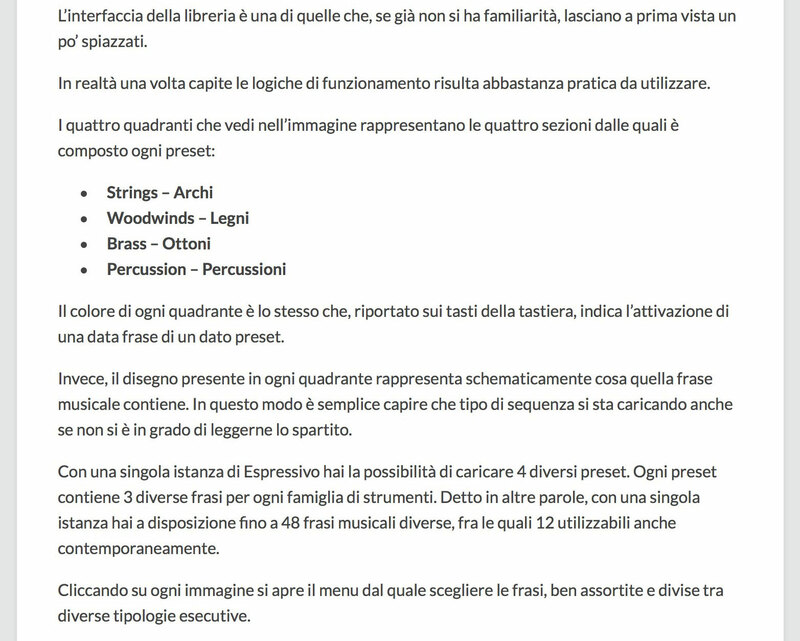 The samples for Espressivo have been recorded in the same hall as sister libraries Ostinato, Maximo, Woodwinds Ensembles, Sotto, Capriccio, Grosso, Minimal, Da Capo, Tutti and Vivace. 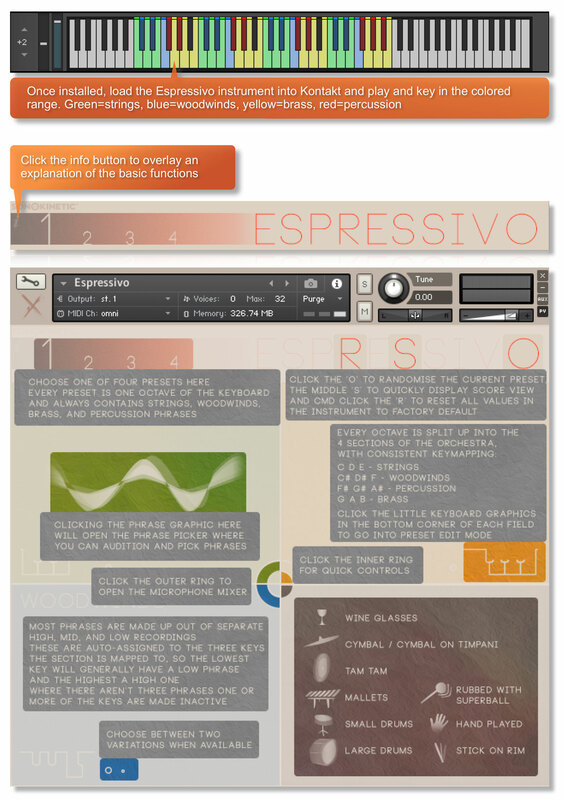 As such, Espressivo has similar options for microphone mixing; Close, Decca Tree, Wide and Far (balcony). It is possible to use just one microphone position or mix between two different positions. Mixing is controlled by dragging the slider. The crossfade operates in such a way that the central position will play both microphone positions at full volume. 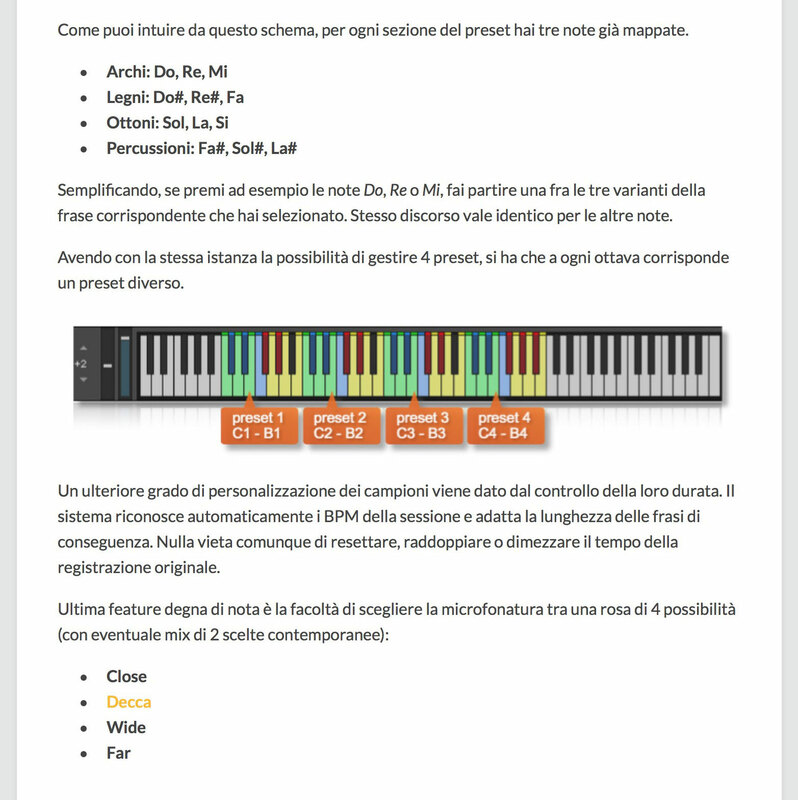 Microphone mixing options are global and apply to the entire instance of Espressivo including all phrases and presets. Note that activating multiple microphone sections puts additional strain on CPU usage. 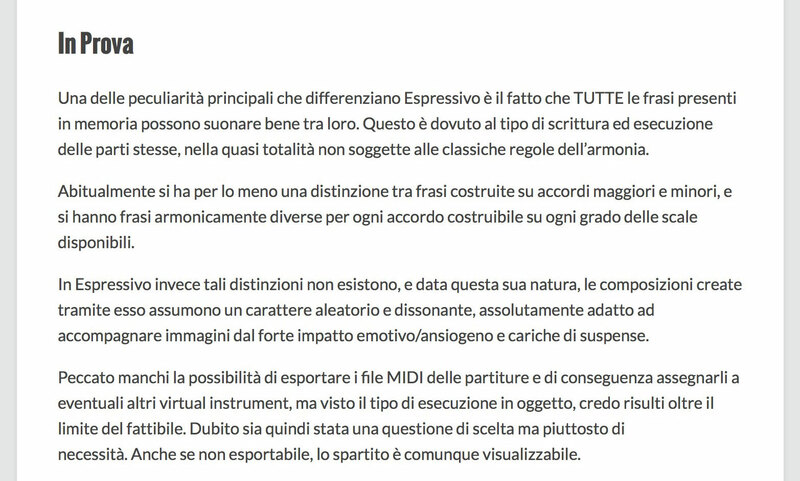 We have included a ‘Lite’ version of Espressivo. This patch function in exactly the same way as the full version but does not have microphone-mixing options. Instead, the samples have been pre-mixed from the four recorded positions. Use this patch when you only need just one pre-mixed version of Espressivo, which will conserve RAM and CPU. Once you’ve chosen a phrase, the high, mid and low versions of it will be assigned to the relevant 3 keys of your keyboard, depending on the orchestra section and preset. Be aware that with a few patterns there may not always be 3 phrases available, and 1 or more of the 3 keys may not have a phrase assigned. This is normal and reflects that there is not necessarily an obvious high, mid and low split for that phrase. Sometimes there will be variations of the phrase available. These variations are derived from the original recording sessions and are usually different takes of the same kind of phrase. The small keyboard graphic at the bottom of the options window indicates which preset you're currently editing (preset 2 is shown here). By default the MOD wheel of your MIDI keyboard will control the output volume of all playing phrases. However, it’s possible to disable MOD wheel control for one or more phrases. This allows greater expression as you can keep the volume of one or more phrases constant whilst changing others with the MOD wheel. Use this to create interesting, constantly changing phrases and crescendos / decrescendos. Click these buttons to toggle MOD wheel on / off. For each of the high, mid and low phrases, drag the buttons up and down to adjust the overall volume of that phrase. Left-click whilst holding cmd / control to reset to default. For each of the high, mid and low phrases, drag the buttons left and right to adjust the panning of that phrase. Left-click whilst holding cmd / control to reset to default. Each of the high mid and low phrases in can have its tuning adjusted by +/- 2 semitones. This adds some more variety and flexibility to the instrument and is handy for creating a more dissonant sound. 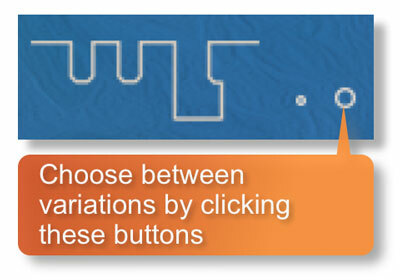 Drag the buttons up and down to adjust the tuning of a phrase. Left-click whilst holding cmd / control to reset to default. Espressivo features release tail samples for all phrases. These give a realistic and appropriate release note or reverb tail when keys are released. The release samples become especially important if you choose to truncate the playback of a phrase, where a realistic end note will be played. 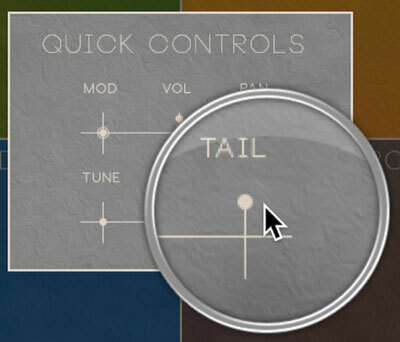 The release tail offset of the 3 phrases can be adjusted by using the 3 vertical sliders. Decrease the level of the slider to begin playback further into the release samples. To turn the release samples off completely just lower a slider completely. Left-click whilst holding cmd / control to reset to default. This is one of the most interesting aspects of Espressivo. By default every time you hit a key a phrase will trigger with playback from the beginning of the phrase. 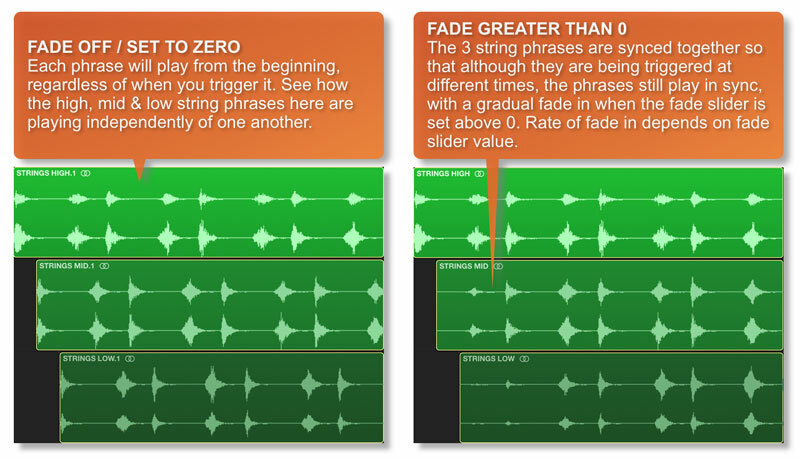 However, using the fade sliders you can sync the playback of one phrase to another. This second phrase will gradually fade in at a speed dictated by the slider value. The two (or more) phrases will play in sync, regardless of when they were triggered. Some key points here: This syncing is limited to a single preset and a single orchestral section (for example preset 1: strings or preset 3: woodwinds). Also, the first phrase you play of that preset / section will always trigger straight away, with no fade in, regardless of the fade slider setting. The next phrase (or two) will fade in, the speed dependant on the slider value. Phrases in Espressivo have been recorded at 130 BPM - although not all phrases have an obvious rhythm, some being sustained notes or improvised phrases. If there is a rhythmic element to the phrase you’ll see this icon in the options window. Click the ITM icon to change the playback speed of the phrase, relative to your DAW’s BPM. The phrases will always sync to your host DAW tempo, being time-stretched in Kontakt to match the BPM of your composition. If you want/need to reset all of your adjustments for mod wheel, volume, panning, tuning, fade time and release tail then that is possible, all in one go. This is useful if you find the instrument is sounding strange due to tweaking, or if you simply want to start with a clean slate. 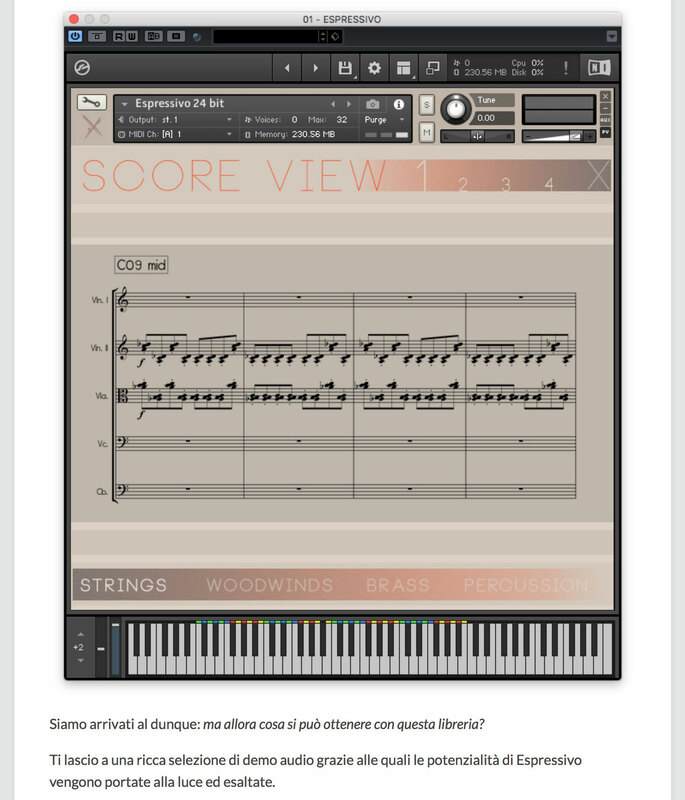 The phrases in Espressivo are represented by graphics instead of actual notations. However, clicking on the score icons shown here will access the original notation. This will open a large Score View, where you can view the currently selected phrases in a notated form. 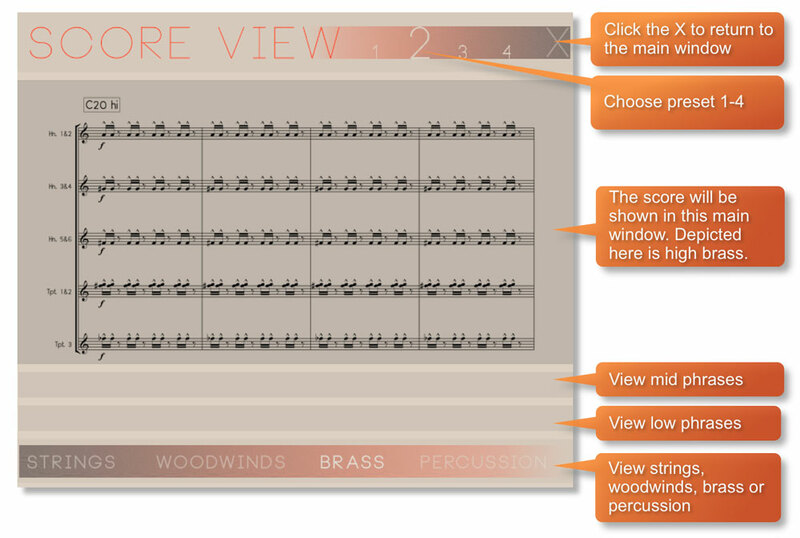 From this window you can directly access the scores for all 4 presets, the 4 orchestral sections and high, mid and low phrases. 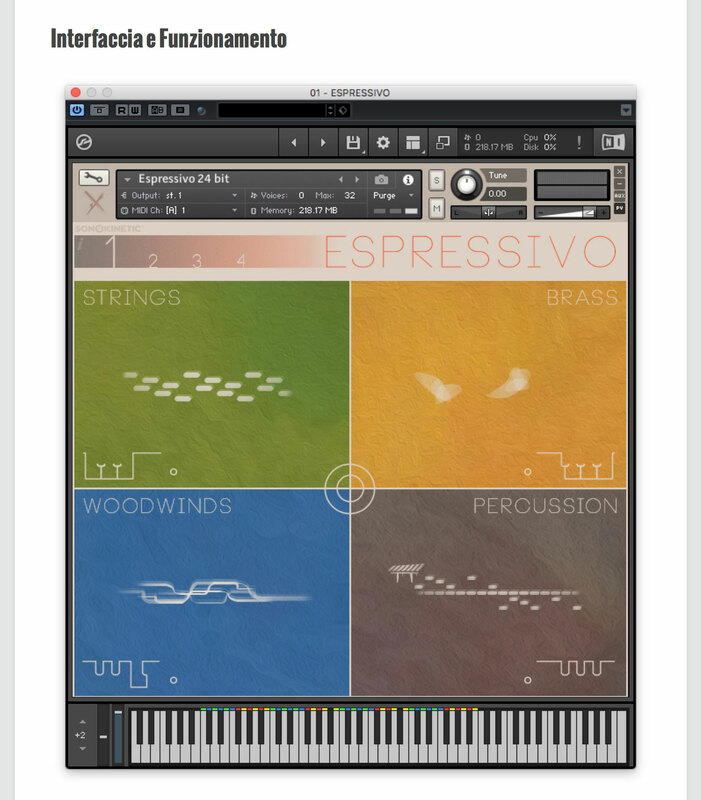 The basic method of playing Espressivo is very simple, just press a key in the range C1 to B4. Depending on which key you press, it will trigger a tempo-synced string, brass, woodwind or percussion phrase from one of the 4 preset fields. Sustain the phrase either by holding the key down or using a sustain pedal. When the phrase finishes a release sample will normally be played. For every new note you press, the phrase will start playback from the beginning, unless you have opted to adjust the FADE parameter as outlined on page 13. 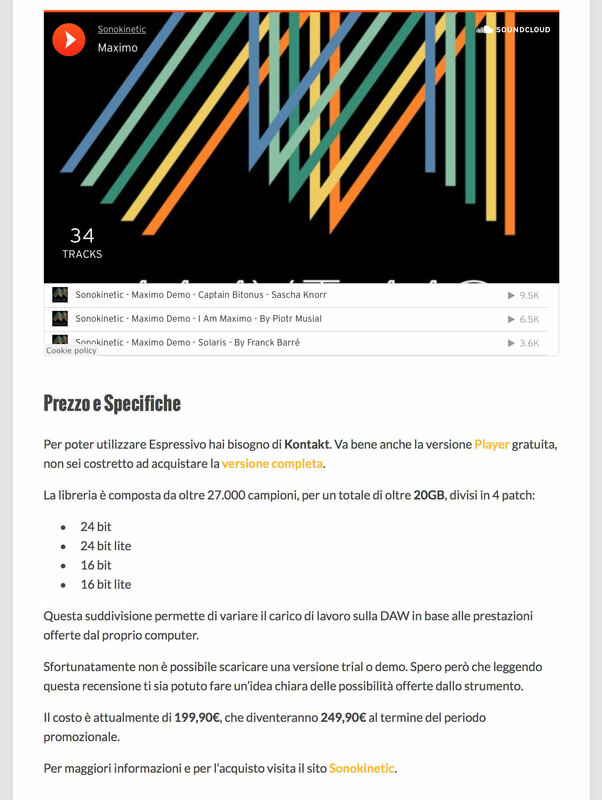 Espressivo features release samples for all phrases. These give a realistic and appropriate release note or reverb tail when a phrase ends. The release samples become especially important if you choose to truncate the playback of a phrase, where a realistic end note will be played. Although the 3 keys each of strings, brass and woodwinds are roughly split into high, mid and low sections, the percussion cannot be categorised in the exactly same way. 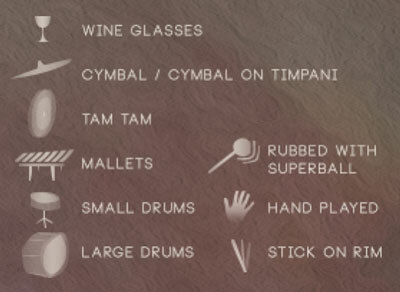 Instead, there are graphics representing the percussion used to make it easier to find what you’re looking for in the phrase picker. We have tried to stick to some form of low-mid-high for similar patterns, which means you can for instance have a low drum on F#, small drum on G# and glockenspiel on A#.